Romano-British gold finger-ring of hollow construction, with cameo setting in a white stone on a blue background. The finger ring is complete but has been squashed and dented in a number of places, and also has a tear in the surface. The hoop is 'D'-section and has faceted shoulders. The setting for the stone is oval and has a narrow flattened band around it. The setting is an engraved cameo of white agate against a light blue background. 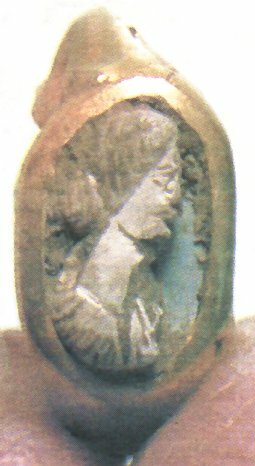 It shows a draped female bust to the right with a hair bun and what might be a narrow hair-band. There is slight damage to the front of the face, which makes the features look rather flat. Discussion: By comparison with portraits on coins of Marcus Aurelius's wife Faustina II (empress AD 161–76) the hairstyle would imply a late 2nd century date. The bust is likely, however, to be private portrait.